In other research reviews, you have learned about the effects of different forms of exercise on post-exercise energy expenditure, AKA the "afterburn." 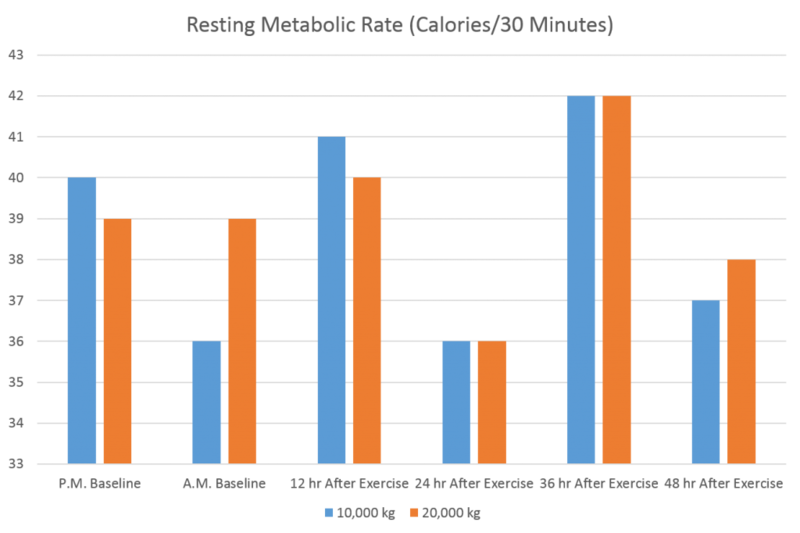 You have learned that the “afterburn” caused by moderate exercise is quite small, amounting to only an extra 30 calories per day or so. The “afterburn” caused by intense interval training isn’t much better, perhaps giving you about 30 more calories of energy expenditure during recovery compared to moderate exercise. The only type of exercise that does give you a sizable increase in energy expenditure during recovery is resistance training. In fact, a high volume resistance training session can increase your metabolism by up to 8-9% for 3 days after the session is complete. A low volume session has also been shown to increase metabolism by about 5% in untrained individuals. These studies on weight training have looked at training volume in terms of number of sets and repetitions. Volume can also be viewed in terms of load volume (the load multiplied by the number of repetitions). The question becomes as to the impact of load volume on the post-exercise elevation in energy expenditure. A study published in the Journal of Strength and Conditioning Research investigated this. Eight men between the ages of 19 and 29 participated in the study. They had at least 12 months of resistance training experience with no more than 2 weeks rest at a time, less than a total of 4 weeks off within the last 6 months, or 9 weeks off within the last 12 months. Height and weight were determined, and body composition was estimated using skinfolds. Subjects were also tested for their 1-RM on the bench press, squat, bent-over row, and Romanian deadlift. Subjects recorded food diaries 3 days prior to and 48 hours after the first exercise trial; subjects were instructed to replicate this diet before and after the second experimental trial. Subjects refrained from resistance training for 72 hours prior and from high intensity aerobic exercise 48 hours prior to each trial. On the evening prior to each trial, subjects reported to the lab at 8 PM following a 4 hour fast. 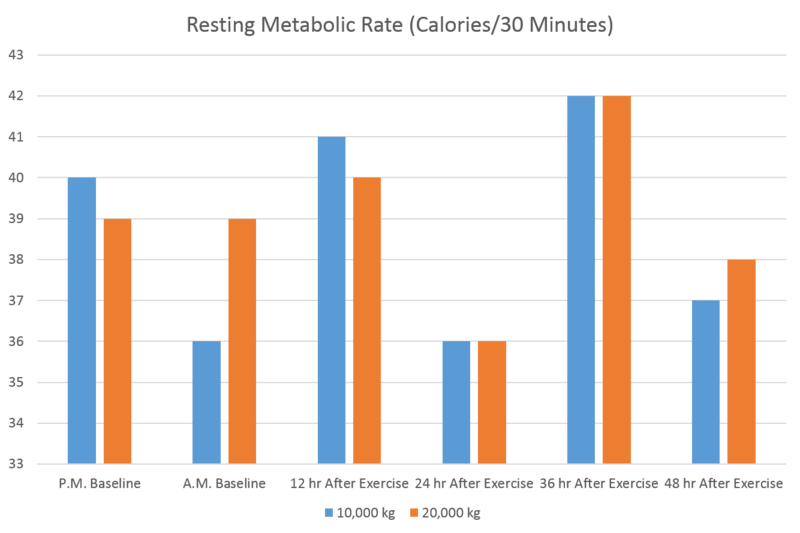 Resting metabolic rate (RMR) was tested for 30 minutes using a metabolic cart. Subjects then slept overnight in the lab. RMR was determined again at 6 am, and blood was taken to determine creatine kinase levels (a marker of muscle damage). A half hour before exercise, subjects were given a Balance Bar Gold. Each resistance training session consisted of 4 exercises on a Smith Machine; the exercises were the bench press, squat, bent-over row, and Romanian deadlift. One trial required lifting a total load-volume of 10,000 kilograms (22,000 pounds), while the other trial involved a total load-volume of 20,000 kilograms (44,000 pounds). The trials were done in a random order and were separated by at least 7 days. The loads were divided between the 4 exercises as follows: 35% for squats, 30% for bench press, 20% for bent-over rows, and 15% for Romanian deadlifts. For each set, subjects performed 6-8 repetitions at 85% 1-RM. If 6 reps could not be done, the load was reduced by 10% for the subsequent set. Subjects took 2 minutes rest between sets. All of the training was supervised. Energy expenditure during each session was determined using a metabolic cart. Immediately after exercise, blood was collected again and tested for creatine kinase. Subjects then returned to the lab for the next 2 evenings at 8 PM to have blood drawn and RMR measured, and then stayed overnight for morning measurements. Creatine kinase tended to be higher after the 20,000 kg session, although the difference was only statistically significant at 12 hours. Muscle soreness also tended to be higher, although the difference was not statistically significant. This indicates a tendency for the higher volume session to cause more muscle damage. Weight Training Afterburn? Where Is It? This study showed that, while the higher volume-load session resulted in greater energy expenditure during the session, there was no differences in RMR between the high and low volume-load sessions. This indicates that the volume load did not significantly impact the "afterburn." In fact, the "afterburn" was practically non-existent in this study. RMR was not significantly higher after training than it was before training. This is at odds with previous research that I have discussed here in Weightology, where a weight training session caused elevations in RMR of 5-9% during the 24-48 hours after a session. So why the difference between this study and previous studies? The answer may lie in the sample size. There were only 8 subjects in this study, which may have made it difficult to detect an elevation in RMR. In fact, when you look at the P.M. RMR data, you can see the average was 2 calories higher than the baseline. This was over a 30-minute time period. If you extrapolate this over 24 hours, this is a difference of 96 calories, which is similar to the magnitude of elevation observed in other research that I have discussed. Thus, the elevation in metabolism was likely there, but just masked by the variability and small sample size. Another factor that may be impacting the lack of RMR elevation is the training experience of the subjects. The subjects in this study had extensive training experience, more than previous studies I have discussed, and were very strong according to their 1-RM measurements. It is possible that the more trained you become, the less a training session will cause an "afterburn." This tendency was seen in a previous study I discussed, where trained subjects had a smaller elevation in RMR compared to untrained subjects. This study is in agreement with a previous study I have discussed, where a higher volume session did not elevate RMR more than a lower volume session. 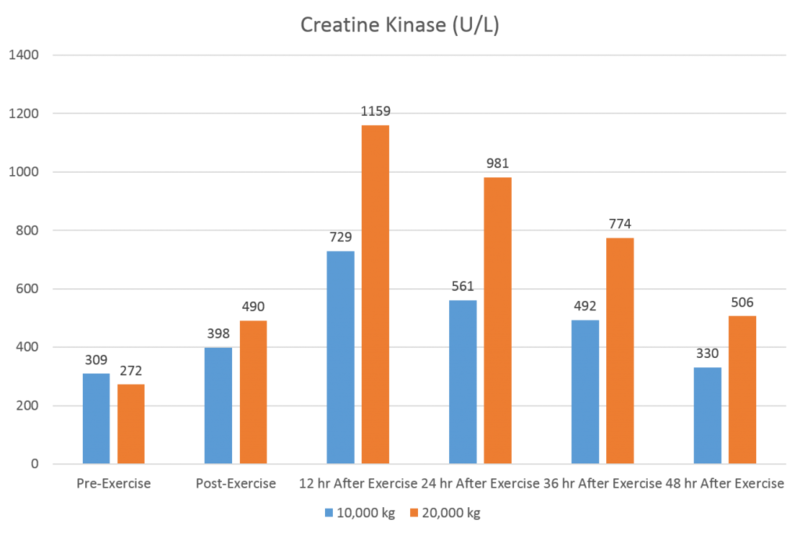 Thus, higher weight training volumes, whether in terms of number of sets or volume-load, do not appear to elevate RMR more, despite the fact that such sessions may be more damaging to tissue as evidenced by a tendency for higher soreness and creatine kinase. The energy expenditure benefit comes from the training session itself; you obviously burn more calories with a higher volume session, which will be more favorable to creating an energy deficit and helping you get leaner. There are limitations to this study. One limitation is that the volume may not have been high enough to cause a dramatic elevation in RMR that the researchers could detect. While there were no differences between higher and lower load volumes in this study or the previous one I discussed, it should be noted that the volume in terms of repetitions was not as high as in some other studies. Total repetition volume in this study was 199. In a previous study I discussed where an elevation in RMR was detected, total repetition volume was 384. Also, in this study, the researchers did not focus on longer eccentric actions, whereas previous research has used an eccentric action duration of 3-4 seconds. The slower eccentric action may be more damaging to tissue, which might elevate RMR more due to the energy needed to repair that tissue. Still, the higher volume session in this study did result in a tendency towards more muscle damage; perhaps the difference was not enough to impact RMR. Overall, this study did not find an "afterburn" effect from weight training, although this may be due to the small sample size. There were also no differences in the "afterburn" when comparing two different load-volumes. The biggest energy expenditure benefit from higher training volumes comes from the additional calories burned during the session itself.